At first the idea of watching someone else play a video game doesn't sound half as much fun as actually playing it yourself, but it's the same kind of difference between having a kickaround in the park with your mates and watching Barcelona vs Real Madrid on the box. In other words, watching other gamers can be an enjoyable and absorbing complement to your own playing, as millions of people are now discovering. Faster internet speeds, better gaming technology, and some celebrity stardust have really helped the scene to take off. Video game streaming is simply that: someone plays a game, and streams it live for an audience to watch. It's already got to be so popular that the major consoles now have streaming technology and software built right in, and it's not difficult to find free programs for broadcasting from a desktop or laptop computer as well. The type of game being featured can be a big draw, as can the person doing the playing - either through their skill or the personality of their commentary, these streaming gamers have become major celebrities in the community. 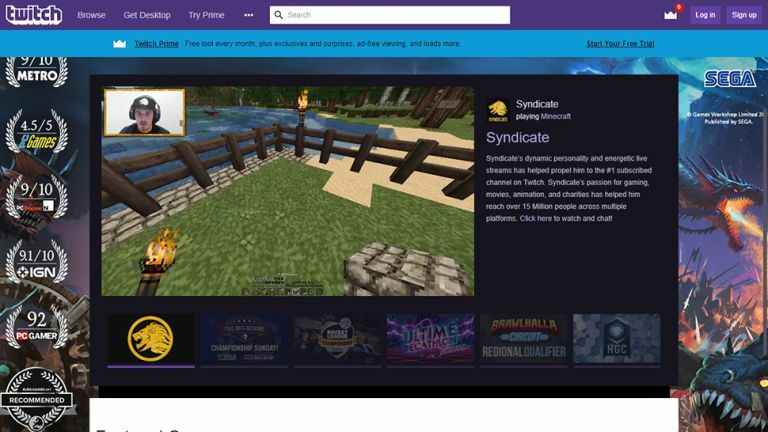 The biggest and most well-known place to watch all of this happen is Twitch, the dedicated platform bought by Amazon back in 2014, but YouTube Gaming is another big name on the scene. Have a click around either of those portals and you'll soon find something of interest. You don't need anything special to get started as a viewer, and just logging on and browsing around is a great way to see what all the fuss is about. Take a look at some of the numbers and you can see the impact live video game streaming is having: Twitch reports 15 million active users a day, with up to 2 million people watching streams at the same time, and an average of 106 minutes watched per person per day. Those kind of figures are hard to ignore, and it looks like the trend is only going in one direction, as more of us get online, connection speeds go up, more and more games come out, and viewers demand more content. Streaming has become more popular as gaming itself and indeed computing in general has gone online - the same kind of technological breakthroughs and user demand that created Netflix and Spotify have given birth to Twitch.tv and YouTube Gaming. And for the most popular streamers, the rewards can be huge too - the most popular YouTuber in the world, PewDiePie, broadcasts to more than 57 million subscribers right now, and a big chunk of that audience turns up to watch him play video games. Many more streamers have follow counts in the hundreds of thousands and millions. If you're still bamboozled as to why video game streaming has taken off like it has, there's more than one reason: some people like the entertainment value, the fun of watching someone else do brilliantly (or terribly) at a game. The rise of esports is a part of this as well, watching gamers take on each other in serious competitions for serious prizes. Others tune in to get an idea of what a particular game is like before they go out and get it - watching a few minutes of gameplay action can often be a lot more revealing than reading a developer's description of a game or reading a review. Then there's the community aspect - connecting with fellow gamers whether it's the people broadcasting the show or the people leaving comments underneath the clips. If you're into your gaming, it can be a fantastic all-round experience. To go back to the football analogy we used earlier, it's not just like watching Ronaldo and Messi from a distance, because you can interact with them (and their fans) as well. As we've already pointed out, getting started as a viewer is very straightforward - you just open up Twitch or YouTube Gaming in your browser and start clicking around. You'll soon find games and presenters that you're interested in. If you want to get more involved, then subscribing to channels and leaving comments only takes a few clicks, and works just like it does on somewhere like YouTube. Eventually you might want to start doing some streaming of your own, and again it's not difficult - if you've got a webcam, you can start streaming straight away for free, though to really start racking up the subscribers you need to stream game footage as you play. Programs like the free OBS Studio can get your games streamed from a computer live to Twitch.tv or YouTube, and mix in your own audio and video commentary if you want (a lot of gamers show their reactions in a small box in one corner as they go). If you've got an Xbox One S or PlayStation 4 then everything you need to get started streaming is already built in - Microsoft's console only natively supports Twitch for now though, while Sony's machine supports Twitch and YouTube Gaming.